All components (except dice) are included--the adventure booklet, rules, counters and paper board. 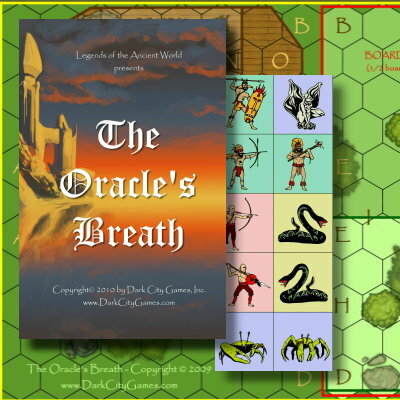 Legend has it that the 'Oracle's Breath' is a powerful relic. Whosoever possesses the trinket can write his own fate. 'Rumors often exceed the truth,' you smirk to yourself. It is no surprise, however, that one day, Caius, a powerful merchant, approaches your group and makes a very lucrative offer. 'Return the Oracle's Breath to me, and I will pay each one of you who comes back 300 silver pieces,' he states. But that was weeks ago. Now as your skiff approaches the damp wooden pier in the smothering fog, only one thought races through your mind. "What have I gotten myself into!" So you grab your weapons, and tie off, preparing for riches and reward, or a fight for your life in search of the Oracle's Breath.